"Best way to know if your idea is good or bad is to pitch it," said Jess Falkenthal, member of Startup Weekend, as the Terre Haute version of the business completion got underway. Two teams learned their pitches were a good idea. A team proposing a weighted blanket-like product to prevent it from blowing away in the wind won first place at Startup Weekend Terre Haute, a weekend-long competition in which aspiring entrepreneurs and inventors crafted business plans for a new device or business. The team winning first place created Beach Ez 360, a weighted blanket that doesn't blow away in the wind. The mat, which is ideal to take to the pool or the beach, includes a waterproof pouch for electronic devices. Second place was Underground Recruitment, a proposed website that would give high school athletes an opportunity to create a profile featuring their accomplishments for college recruiters to review. "What made the winners stand out was that they identified not only an area that was underserved, but they also put together a nice draft of a business plan through the course of the weekend," said Heather Strohm, director of the West Central Indiana Small Business Development Center. The center, which is housed at Indiana State University's Federal Hall, hosted the competition. Four judges participated in selecting the winners. The judges had experience with business and finance and came from different parts of the United States. 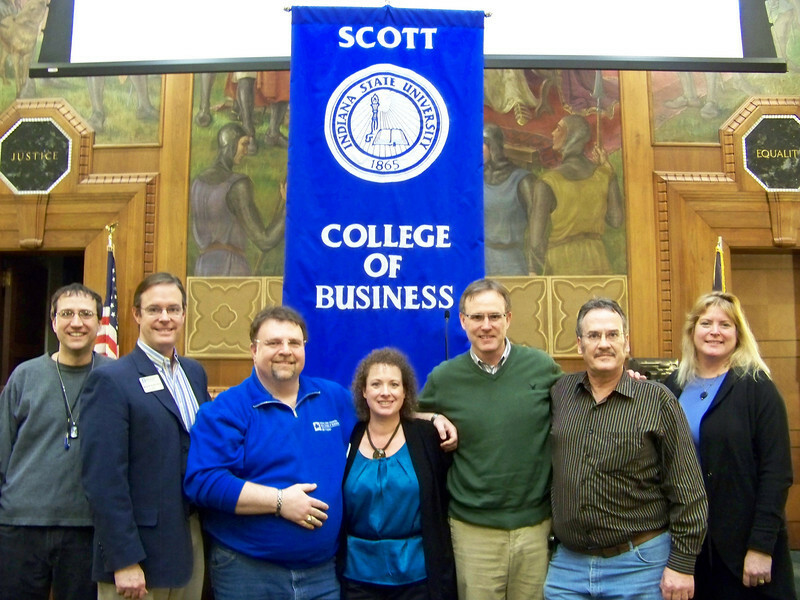 Several Indiana State faculty members, including Scott College of Business dean Brien Smith, participated as judges and hosts. The judging criteria for everyone included customer validation, the business model and feasible execution. Some of the prizes Melissa Padgett, Walter Padgett, Brian Lakstins, Rick Culiver and Thomas Jefferson Gosnell received for Beach Ez 360 included a business development program, a one-year website host and a corporate entity formation valued at $500. More than 15 people presented their pitches to everyone, after which people in attendance selected a group whose business idea they thought would be good to continue developing over the weekend. There were a variety of pitches, from helping people with their taxes, to creating apps on how to play an instrument and even creating a headset to wear during fire emergencies. "I think the Start-Up Weekend is very beneficial. It provides real-world experience that hurdles over issues that present themselves when starting a company," said Bryan Morgan, an Indiana State student who participated in the Terre Haute Startup Weekend competition. "While having the coaches and mentors there, it helped them discover the tactics to overcome issues." "Business majors or not, 43 percent of students want to start up a business, this event can help them learn," said Strohm. "I think students should come to this to help build connections in the community and they have an opportunity to leverage their skills." Startup Weekend is a global nonprofit organization that gives aspiring entrepreneurs a chance to learn about launching a business and the basic concept involved. The organization has hosted other weekend competitions, though this was Terre Haute's inaugural event. "We had a great turnout, especially considering this was our first Startup Weekend," said Brien Smith, dean of the Scott College of Business. "We promoted the event, and I think the participants learned a great deal from the 54-hour event. I can't wait to see what next year brings us." Photo: http://isuphoto.smugmug.com/photos/i-35VgRXp/0/L/i-35VgRXp-L.jpg (Submitted photo)Brien Smith (second from left), dean of the Scott College of Business at Indiana State University, poses with the members of the team that proposed Beach Ez 360, a weighted blanket-like item that will not blow away in the wind. The team won first place at Startup Weekend Terre Haute, a weekend-long business competition where the team members pitched their idea, then created a start-up plan on how they would implement it to become a successful business. Photo: http://isuphoto.smugmug.com/Events/Terre-Haute-Startup-Weekend/i-DKkFbRF/0/L/02_09_13_Terre_Haute_startup_weekend-8093-L.jpg (ISU/Tony Campbell)A team works on honing their business proposal during the Startup Weekend Terre Haute competition in Federal Hall. 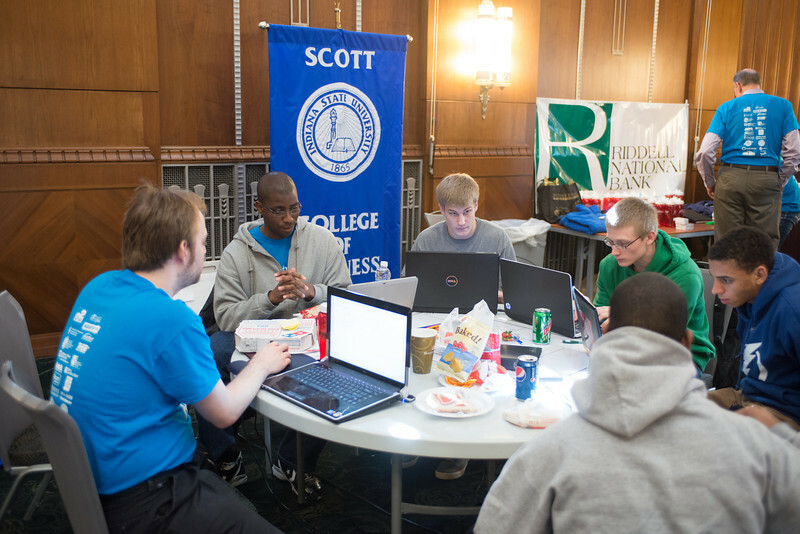 The Terre Haute competition was part of a larger network of events that features teams creating plans for a new business or device, with the winning team winning services and support to help make the plan a reality. The team winning first place of Startup Weekend Terre Haute created Beach Ez 360, a weighted blanket that doesnâ€™t blow away in the wind. The competition was part of a larger effort to promote aspiring entrepreneurs to create start-ups.